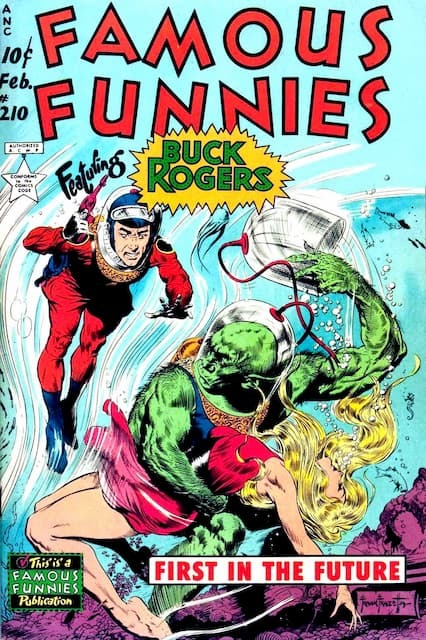 Buck Rogers is a 1939 Universal serial film starring Buster Crabbe (who had previously played the title character in two Flash Gordon serials and would return for a third in 1940) as the eponymous hero, Constance Moore, Jackie Moran and Anthony Warde. It was based on the Buck Rogers character created by Philip Francis Nowlan, which had appeared in magazines and comic strips since 1928. In 1953, the 1939 movie serial was edited into a feature film entitled Planet Outlaws, by Sherman Krellberg for release via Goodwill Pictures Inc. In 1938, Lieutenant Buck Rogers (Buster Crabbe) and Buddy Wade (Jackie Moran) are part of the crew of a dirigible flying over the North Pole. They are caught in a savage storm and crash. They are ordered to release the experimental Nirvano Gas, which (unbeknownst to them) will put them in suspended animation until they are rescued. The Nirvano Gas works, but the dirigible is buried in an avalanche and is not found until 500 years have passed. When Buck and Buddy are found, they awaken in the year 2440 to a world ruled by the ruthless dictator, Killer Kane (Anthony Warde), and his army of “super-racketeers”. Only those who live in the “Hidden City”, run by the benevolent scientist Dr. Huer (C. Montague Shaw) and his military counterpart, Air Marshal Kragg (William Gould), resist the criminal rulers of Earth. Buck and Buddy join the resistance. They volunteer to go to Saturn, where they hope that they can find help in their fight against Kane. Wilma Deering (Constance Moore) is assigned to accompany them. Saturn is run by Aldar (Guy Usher) and the Council of the Wise and Prince Tallen. To the dismay of Buck and Buddy, they also discover that Kane has dispatched ambassadors of his own, headed by his loyal henchman, Captain Laska (Henry Brandon). The serial then becomes a back-and-forth struggle between Buck and Kane to secure the military support of Saturn.